Amazon renews its Alexa devices and introduces half a dozen all-new smart home devices. Echo Show, Dot and Plus have been revised and equipped with new functions, three completely new devices significantly expand the possibilities of Alexa once again. Amazon has completely redesigned the Echo Show and made it more compact. The display is 10 inches, the camera for video calls has 5 megapixels. In the new version of the Echo Show, a smart home hub with Zigbee is integrated and serves as a control center for many networked devices. The display is complemented by dual, side-radiating 50mm neodymium stereo drivers, a passive bass radiator and Dolby processing. Customers will also have the opportunity to use the new video doorbell integration with Ring products. You can then ask Alexa to let you know when someone is ringing. To see who is in front of the door or to talk to the visitor without having to open the door, just say "Alexa, show the front door camera". Alexa routines can also be used to define individual notifications as soon as the camera registers movements or someone rings the bell. The new video doorbell integration will be available shortly. The 2nd gen Echo Show still costs $229.99 and is available for pre-order. A stand is also available for it, with which the tilt angle of the Echo Show can be adjusted. Amazon has made the Echo Dot a little more rounded in design and given it a fabric surface. The little Alexa puck got a new speaker to get louder even without connected speakers. Echo Dot is available in anthracite, light grey and sandstone and costs $49.99. The $149.99 Echo Plus will also be reissued. The Alexa loudspeaker with Zigbee hub serves as an integrated control centre for the Smart Home and integrates all devices into the network. Echo Plus automatically searches for compatible lamps, door locks or plugs and sets them up when you say "Alexa, find my devices". Additional hubs or apps are not necessary. Echo Plus now also has an integrated temperature sensor. This means that temperature-based routines can be defined in combination with other smart home components. If, for example, the 27-degree mark is reached in the living room, Alexa can send a notification to the smartphone and switch on a fan connected to a smart socket. The new Amazon Echo Plus 2018 features a larger 63.5mm neodymium woofer and is louder, providing fuller bass and clearer mid-range and treble. The unit features a completely new fabric design and is available in anthracite, light grey and sandstone. The first of three completely new Alexa products is the Echo Input. The $34.99 gadget is an Echo Dot without a loudspeaker, which serves to connect existing loudspeakers with Alexa via its jack socket. Similar to the Google Chromecast Audio, the Echo Input cannot output any tones, it is dependent on a loudspeaker. Four microphones ensure that Alexa understands all commands well. With the new Echo Sub the Alexa loudspeaker series gets its own subwoofer. The Echo Sub, which costs $129.99, can be used wirelessly with other Echo loudspeakers to create a 1.1 or 2.1 sound system, but cannot be used alone. In addition, the equalizer function can be used to adjust the bass, midrange and treble via speech: "Alexa, turn up the bass." The latest new device is the Smart Plug, a classic switchable socket. The Smart Plug is attached to the Wi-Fi and is supposed to be particularly easy to set up. The Alexa app can be used to control the system, and routines can also be set up to switch on the coffee machine when you get up, for example. The Smart Plug costs $24.99. AmazonBasics is putting out a new connected microwave compatible with the new Alexa Connect Kit, which will also be made available to third-party device makers. Rather than listening through a microphone, the microwave connects to your Echo devices over Bluetooth. Do we really need a $59.99 connected microwave? Amazon thinks we do, touting that it comes with “dozens of quick-cook voice presets, so you can cook just by asking Alexa.” There’s a built-in Ask Alexa button that you can press and say simple commands like “two minutes and 30 seconds on medium” instead of fiddling with dials and buttons. There's also a new Echo Wall Clock that works in a similar way...it connects to your Echo over Bluetooth, and you can use Alexa commands to set timers and alarms, as well as change the time. With Guard activated, Alexa can send you Smart Alerts with audio clips when specific sounds are heard, including breaking glass or smoke alarms. Say something like “Alexa, I’m leaving” when you go out and Alexa alert you if it hears anything suspicious. It also comes with an Away Lighting mode that uses machine learning to turn your smart lights on and off in a natural-seeming way to deter would be burglars from breaking in. Speaking of security, the Ring Stick Up Cam was also announced in both wired and battery-powered configurations. The $179.99 Stick Up Cams both offer 1080p video, night vision, motion detection, and IPX5 water resistance. A first for Ring, the new cams can be used both indoors and outside and integrate with the Ring Alarm when used inside the house. The wired variant is already available for pre-order, the battery-powered version should come out in December. 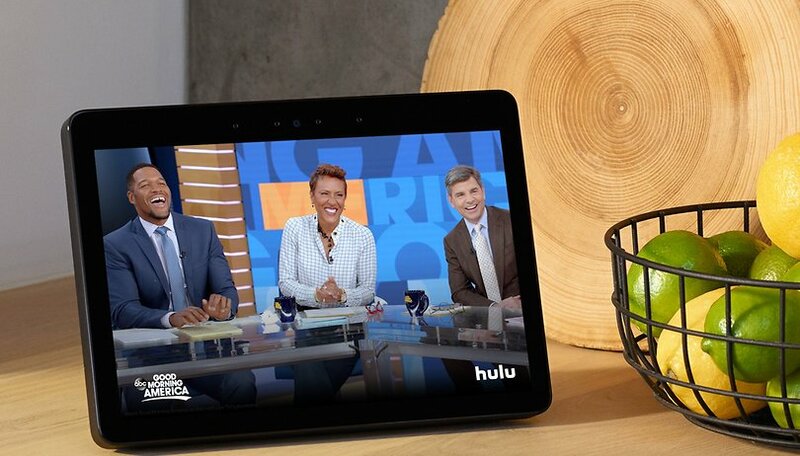 In addition to these new devices, we also get the Echo link to boost Amazon's own multi-room audio functionality, and the arrival of over-the-air TV channels (ABC, CBS, FOX, NBC) to the Fire TV with the new Recast DVR. With all these new products either available for pre-order now or preparing to ship just before holidays, it's clear that Amazon is aiming to make 2019 the year of Alexa. What do you think of Amazon's new products? Do you have an eye on any for yourself?